The meaning of life is to find a life of meaning, says author Chip Conley. Here are some suggestions for exploring meaning in your own life. Rethink your assumptions and link them with your “why.” Suffering often occurs at the intersection of old and new thinking. We suffer when we hold on to perspectives that no longer serve us and fail to see a new way to reframe our lives. Look for possible assumptions at the root of your suffering, and question whether these assumptions are still valid. Can you imagine a new way of thinking? Consider Bethany Hamilton, the teenage champion surfer who lost an arm in a shark attack. Bethany suffered great physical trauma, and most people assumed she’d never want to enter the ocean again. But less than one month after the incident, she got back up on her board and retrained herself to surf with just one arm, and today she continues to win competitions. Get in touch with your own purpose, and look for ways your difficult experiences can support you in living out your purpose. Find a way of expressing yourself. For some people (right brainers), expressing themselves is cathartic because it means letting go of emotions. For others (left brainers), the process of communicating about a difficult experience may create some logic or rationale for why all this is happening. Whichever you are, you can transcend your suffering and get in touch with its meaning by developing a narrative, story, or theme that helps you see how, in the long run, this experience was a serendipitous match for you on your life’s path. You can express yourself in a journal, in some kind of support group, in a religious or spiritual practice, or in collecting and displaying images and objects that represent what you’re feeling. Take care, though, not to use those expressions to wallow in the suffering. Be willing to discover whatever meaning may come. 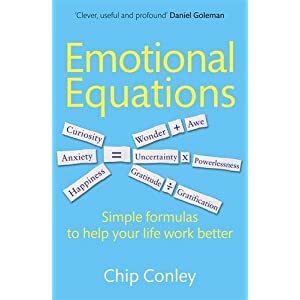 Click here for more information about Emotional Equations. Lots of people are so distracted by searching for the light at the end of the tunnel that they cannot see clearly what’s right next to them. Creating an abstract idea of meaning can just become another distraction. What is life asking of you right now? Can you light a figurative candle in your hand to illuminate this moment so that you and those around you can make a difference today? You could apply this same thinking to your family: “How can I show up as a role model when I get home tonight?” What can you do to take attention away from the bad news (suffering) and focus it instead on that which you can control (meaning)? Describe the “new you.” Consider how much you have grown as a result of the challenges you’ve faced. Make a list of five adjectives—for example, creative, patient, compassionate, wise, or resilient—that describe you as a result of what you’ve gone through. Then imagine how this “new you” will make a real difference in the world and help you to become a role model for others. Don’t worry, I’m not asking you to be the next Mahatma Gandhi. Just define the new habits or behaviors that have sprouted from this difficult time that will support and strengthen your character as you move forward. I also recommend reading one of Frankl’s favorite books, Leo Tolstoy’s novel The Death of Ivan Ilyich, the tale of a man who suddenly learns he is about to die and is confronted with the fact that he’s wasted his life. This insight floods him with a new sense of inspiration that carries him into becoming a “new person” even though he had only a few days of life remaining. When we can’t find meaning, we often seek stimulation or distraction instead. That’s not the end of the world, but don’t wait until you have only a few days left to experience your meaningful life. This equation is relevant to you whether you prefer Dolly Parton to the Dalai Lama or your idea of a good time is the Las Vegas strip, not a Buddhist temple. Meaning can find you anywhere—in a park with your kids or in a lunch conversation with a coworker—just be open (and willing) to be found. To paraphrase Nietzsche, the measure of ourselves is how we transform pain or suffering into something worthwhile or meaningful in our lives. Excerpt from Chip Conley's book, Emotional Equations: Simple Truths for Creating Happiness & Success, published by Free Press. To buy the book, click here.